These are some of the awards we have received for our services, just to show you our commitment towards providing you with the best web analytics and services. 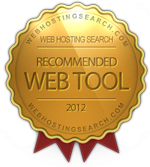 WebHostingSearch.com award for best web tool is not something that many companies or sites can brag about. To receive this award you have to provide extra value to your users. This award is handed out only if we have been convinced that it's a useful and qualitative tool and resource before we even consider it for an award. If you use sign up for, or use one of these web tools you can rest assured that you will be more than pleased. "WebRank SEO" and "Webrank Toolbar" has been tested in the Softpedia labs using several industry-leading security solutions and found to be completely clean of adware/spyware components. Softpedia guarantees that "WebRank SEO" and "Webrank Toolbar" are 100% Free, which means they does not contain any form of malware, including but not limited to: spyware, viruses, trojans and backdoors.